by Chris Woodford. Last updated: April 10, 2018. A few hundred years ago, people would have given an arm and a leg to have central heating in their homes. Just imagine the inconvenience of having to light a wood and coal fire in every separate room to keep your house warm. The basic idea of central heating is really simple: you have a boiler (an easily controllable furnace, fueled by gas) in a handy place like your kitchen or bathroom and it uses water, moved by an electrically powered pump, to carry heat into radiators in all the other rooms. It's simple, convenient, efficient, and it makes even winter days a pleasure to endure! Photo: The gas jets inside a boiler fire up to heat the water. Natural gas burns blue when it has the right amount of oxygen. If it burns yellow, there's not enough oxygen and your boiler may be creating a dangerous, toxic gas called carbon monoxide. That's why you should always have a carbon monoxide detector somewhere near a gas boiler. Right: This is a very old Chaffoteaux combination gas boiler with its cover removed. The inset closeup photo shows where the gas jets are (at the bottom) and how they transfer heat energy to the main heat exchanger at the top. 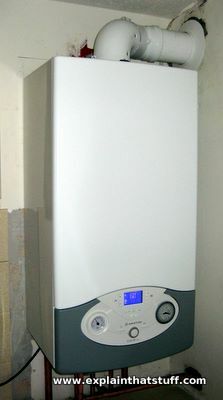 The boiler is the most important part of a central heating system. It's like a big fire that has a continuous supply of natural gas streaming into it from a pipe that goes out to a gas main in the street. When you want to heat your home, you switch on the boiler with an electric switch. A valve opens, gas enters a sealed combustion chamber in the boiler through lots of small jets, and an electric ignition system sets them alight. The gas jets play onto a heat exchanger connected to a pipe carrying cold water. The heat exchanger takes the heat energy from the gas jets and heats the water to something like 60°C (140°F). The water pipe is actually one small section of a large, continuous circuit of pipe that travels right around your home. It passes through each hot-water radiator in turn and then returns to the boiler again. As the water flows through the radiators, it gives off some of its heat and warms your rooms in turn. By the time it gets back to the boiler again, it's cooled down quite a bit. That's why the boiler has to keep firing: to keep the water at a high enough temperature to heat your home. An electric pump inside the boiler (or very near to it) keeps the water flowing around the circuit of pipework and radiators. 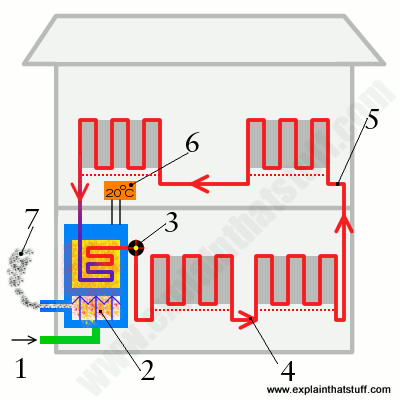 How does home central heating work? Natural gas enters your home from a pipe in the street. All the heat that will warm up your home is stored, in chemical form, inside the gas. An electric pump pushes the heated water through the system. The water flows around a closed loop inside each radiator, entering at one side and leaving at the other. 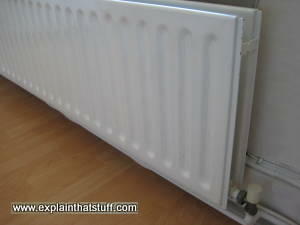 Because each radiator is giving off heat, the water is cooler when it leaves a radiator than it is when it enters. After it's passed through all the radiators, the water has cooled down significantly and has to return to the boiler to pick up more heat. You can see the water is really just a heat-transporting device that picks up heat from the gas in the boiler and drops some of it off at each radiator in turn. The pump is powerful enough to push the water upstairs through the radiators there. A thermostat mounted in one room monitors the temperature and switches the boiler off when it's hot enough, switching the boiler back on again when the room gets too cold. Waste gases from the boiler leave through a small smokestack called a flue and disperse in the air. 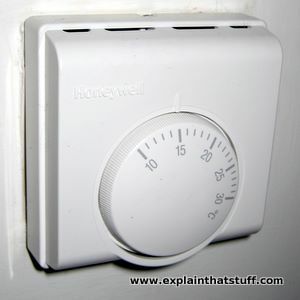 Photo: An electric thermostat. Simply set the temperature you want (in degrees centigrade) and the thermostat switches the boiler on and off to keep the room temperature roughly constant. A basic system like this is entirely manually controlled—you have to keep switching it on and off when you feel cold. Most people have heating systems with electronic programmers attached to them that switch the boiler on automatically at certain times of day (typically, just before they get up in the morning and just before they get in from work). An alternative way of controlling your boiler is to have a thermostat on the wall in your living room. A thermostat is like a thermometer crossed with an electric switch: when the temperature falls too much, the thermostat activates and switches on an electric circuit; when the temperature rises, the thermostat switches the circuit off. So the thermostat switches the boiler on when the room gets too cold and switches it off again when things are warm enough. Photo: A hot water radiator is simply a copper pipe repeatedly bent at right angles to produce a heating surface with the maximum area. The heat pipes follow the ridged lines. Water enters and leaves through valves at the bottom. Many people are confused by hot water radiators and think they can operate at different temperatures. A radiator is just a copper pipe bent back and forth 10-20 times or so to create a large surface area through which heat can enter a room. It's either completely on or completely off: by its very nature, it can't be set to different temperatures because hot water is either flowing through it or not. With a simple central heating system, each radiator has a basic screw valve at the bottom. If you turn the screw down, you switch the radiator off: the valve closes and hot water flows straight through the bottom pipe, bypassing the upper part of the radiator altogether. Turn the screw up and you turn the radiator on, allowing water to flow right around it. In this case, the radiator is on. 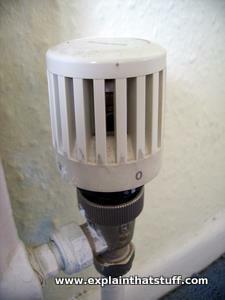 How do thermostatic radiator valves help? Photo: Thermostatic valves fitted to radiators can help you heat your home more efficiently, saving energy and money. Thermostatic valves (sometimes called TRVs) fitted to radiators give you more control over the temperature in individual rooms of your home and help to reduce the energy your boiler uses, saving you money. Instead of having all the radiators in your home working equally hard to try to reach the same temperature, you can have your living room and bathroom (say) set to be warmer than your bedrooms (or rooms you want to keep cool). How do radiator valves work? When the heating first comes on, the boiler fires continuously and any radiators with valves turned on heat rapidly to their maximum temperature. Then, depending on how high you've set the radiator valves, they begin to switch off so the boiler fires less often. That reduces the temperature of the hot water flowing through the radiators and makes them feel somewhat cooler. If the room cools down too much, the valves open up again, increasing the load on the boiler, making it fire up more often, and raising the room temperature once again. There are two important points to note about radiator valves. First, it's not a good idea to fit them in a room where you have your main wall thermostat, because the two will work to oppose one another: if the wall thermostat switches the boiler off, the radiator valve thermostat will try to switch it back on again, and vice-versa! Second, if you have adjoining rooms with thermostats set at different temperatures, keep your doors closed. If you have a cool room with the valve turned down connected to a warm room with the valve turned up, the radiator in the warm room will be working overtime to heat the cool room as well. How do combi boilers make hot water? Most gas boilers also double up as hot-water heaters. Some (open-vented boilers) heat water that's stored in a tank; others (combi boilers) heat water on demand. How do combi boilers work? Typically, they have two independent heat exchangers. One of them carries a pipe through to the radiators, while the other carries a similar pipe through to the hot water supply. When you turn on a hot water faucet (tap), you open a valve that lets water escape. The water feeds through a network of pipes leading back to the boiler. When the boiler detects that you've opened the faucet, it fires up and heats the water. If it's a central heating boiler, it usually has to pause from heating the central heating water while it's heating the hot water, because it can't supply enough heat to do both jobs at the same time. That's why you can hear some boilers switching on and off when you switch on the faucets, even if they're already lit to power the central heating. 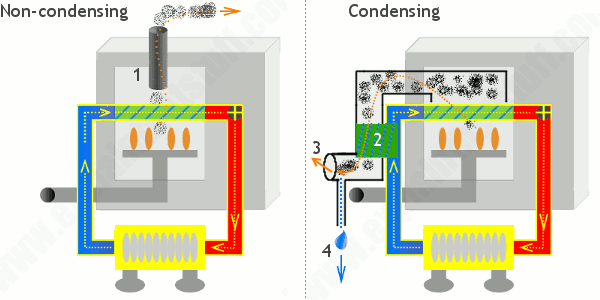 Artwork: How a typical combi boiler works—using two separate heat exchangers. Gas flows in from the supply pipe (1) to the burners inside the boiler (2), which power the primary heat exchanger (3). Normally, when only the central heating is operating, this heats water circulating around the heating loop (4), following the yellow dotted path through the radiators (5), before returning to the boiler as much cooler water (6). Hot water is made from a separate cold-water supply flowing into the boiler (7). When you turn on a hot faucet, a valve (8) diverts the hot water coming from the primary heat exchanger (3) through a secondary heat exchanger (9), which heats the cold water coming in from the outer supply (7), and feeds it out to the faucet (10), following the orange dotted path. 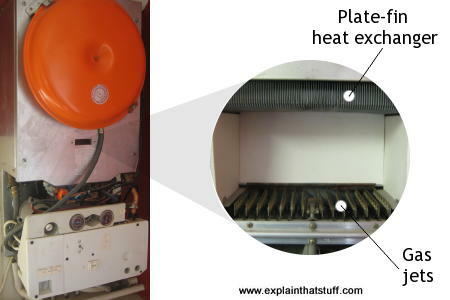 The water from the secondary heat exchanger returns through the brown pipe to the primary heat exchanger to pick up more heat from the boiler (11), following the white dotted path. Gas boilers work by combustion: they burn carbon-based fuel with oxygen to produce carbon dioxide and steam—exhaust gases that escape through a kind of chimney on the top or side called a flue. The trouble with this design is that lots of heat can escape with the exhaust gases. And escaping heat means wasted energy, which costs you money. In an alternative type of system known as a condensing boiler, the flue gases pass out through a heat exchanger that warms the cold water returning from the radiators, helping to heat it up and reducing the work that the boiler has to do. Condensing boilers like this can be over 90 percent efficient (over 90 percent of the energy originally in the gas is converted into energy to heat your rooms or your hot water), but they are a bit more complex and more expensive. They also have at least one notable design flaw. Condensing the flue gases produces moisture, which usually drains away harmlessly through a thin pipe. In cold weather, however, the moisture can freeze inside the pipe and cause the entire boiler to shut down, prompting an expensive callout for a repair and restart. 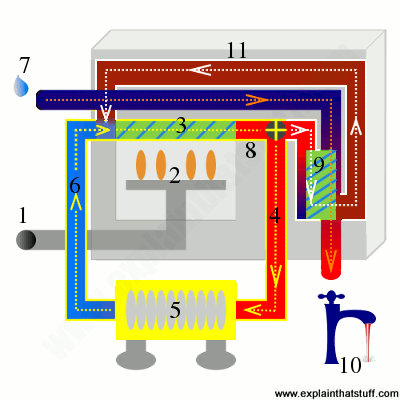 Artwork: How a modern condensing boiler works. Left: In a traditional (non-condensing) boiler, hot exhaust gases leave the combustion chamber through a flue (1), helped on their way by an electric fan (not shown); they take heat with them, reducing the boiler's efficiency by as much as a third. Right: In a modern condensing boiler, the exhaust gases pass through an extra heat exchanger (2), which soaks up most of their heat energy and passes it across to the cold water returning from the radiators. This is what makes a condensing boiler so efficient. The colder exhaust gases exit through a flue in the usual way (3) and moisture produced by condensing them drains away through a separate pipe (4). Can you run a boiler on fuels other than gas? Think of central heating systems as being in two parts—the boiler and the radiators—and you can see that it's relatively easy to switch from one type of boiler to another. For example, you could get rid of your gas boiler and replace it with an electric or oil-fired one, should you decide you prefer that idea. Replacing the radiators is a trickier operation, not least because they're full of water! When you hear plumbers talking about "draining the system", they mean they'll have to empty the water out of the radiators and the heating pipes so they can open up the heating circuit to work on it. Do you always need a pump? Most modern central heating systems use an electric pump to power hot water to the radiators and back to the boiler; they're referred to as fully pumped. A simpler and older design, called a gravity-fed system, uses the force of gravity and convection to move water round the circuit (hot water has lower density than cold so tends to rise up the pipes, just like hot air rises above a radiator). Typically gravity-fed systems have a tank of cold water on an upper floor of a house (or in the attic), a boiler on the ground floor, and a hot water cylinder positioned in between them that supplies hot water to the faucets (taps). As their name suggests, semi-pumped systems use a mixture of gravity and electric pumping. Reader's Digest Complete DIY Manual by Neil Buchanan. Reader's Digest, 2003. Contains a useful section that shows cutaways of gas boilers and explains how the different types work. The new boiler that generates electricity for the National Grid by Miles Brignall. The Guardian, January 17, 2015. Small household CHP boilers are about to go mainstream, Flow Energy hopes. Big freeze presents old problem for modern boilers by Peter Walker. The Guardian, December 27, 2010. Condensing boilers are more prone to freezing than older designs. Natural Gas Wins Over Homeowners by Ken Belson. The New York Times, February 23, 2009. What are the economic arguments for gas? Weighing a Change From Oil to Gas by Jay Romano. The New York Times, April 6, 2008. Does it make sense to convert your home from oil to natural gas heating? The new boiler that's causing a heated row by Philip Inman. The Guardian, April 2, 2005. British government rules require new boilers to be condensing. Heat and Cool Efficiently: A guide to efficient home heating and air conditioning from the US Government's Energy Star website. Furnaces and boilers: A good overview from the US Department of Energy "Energy Savers" program. This is part of their information on Heating and Cooling, which includes lots of useful guidance on how to choose a new heating or cooling system and considers alternatives to traditional furnace and boiler systems. Heating and hot water: An overview of choosing energy-efficient boilers, from the UK's Energy Saving Trust.